Tuesday Zoosday! This baby okapi is pretty much adorable. 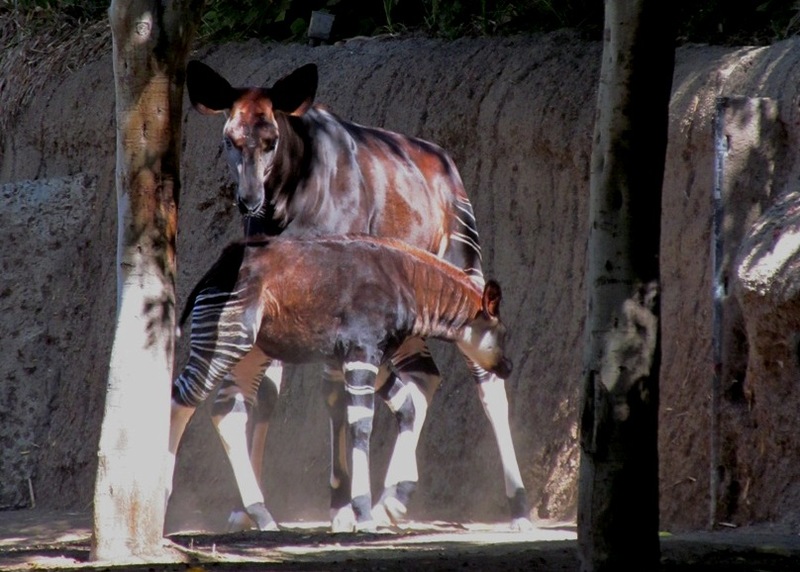 August 13, 2013 May 13, 2014 Joanna V.
So there’s a baby okapi at the San Diego Zoo. She’s a couple of months old at this point, but I got to see her last week for the first time and she is pretty cute. 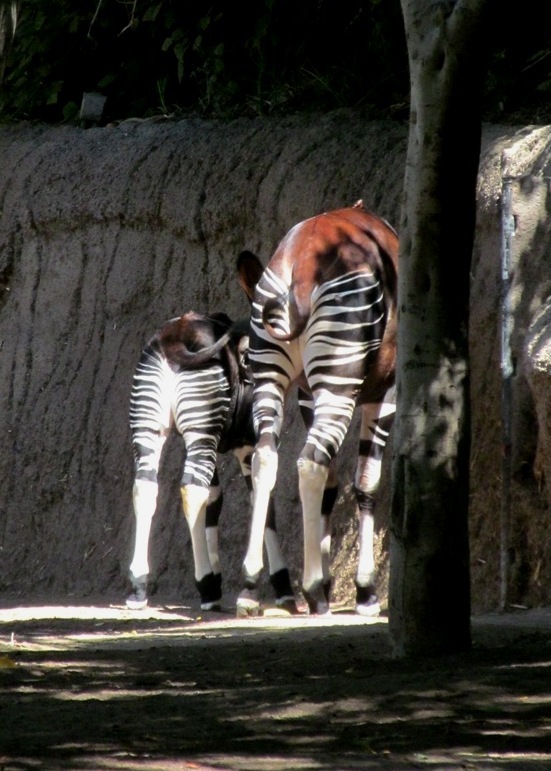 Okapis are a giraffe relative (don’t let those stripey legs fool you into think they might be zebra cousins!) and live in a very small, dense rain forest area of central Africa. There are less than 100 in zoos around the US, and several of those are here in San Diego. They’re fascinating to watch and I always make a point of going by their exhibit. I think the most giraffe-like quality an okapi has is the head. If you look at the shape of the face, and at they way the tongue is manipulated to get shoots of grass or leaves, you can definitely see the family resemblance, I love the huge ears these animals have. I know the photo is super over-exposed, but they were moving quickly in and out of that bright patch of light; usually they hang out in the shadows near the front of the exhibit, but baby girl there wanted to run and explore. She was awfully cute. Have I said that yet? It’s cool though because you can see how their legs blend in with the trees in the foreground, and you can kind of imagine what it’s like when they blend into their native forests. Okapis are part of the Species Survival Plans Program and are a perfect illustration of how zoos benefit and promote species conservation. These animals are SO elusive in the wild that there is almost no way to study them. By observing them in captivity and learning about their reproduction and husbandry, we can learn to manage their populations and hopefully supplement the wild population. There is also a movement to educate people about so-called “bushmeat” which is often okapi or other endangered hoofstock and the like. Previous postCupcakes for One: revisited! Next postWildlife Wednesday: burrowing owls!